Alright, so you've finished Christmas dinner (we're looking into the future here), and you're wondering what to do with all those leftovers. 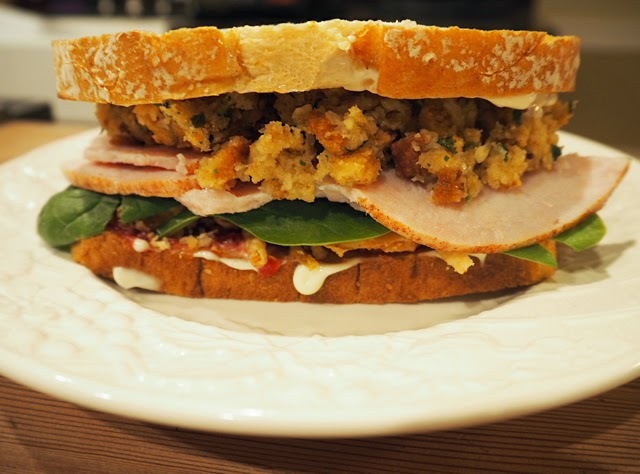 Stuffing, cranberry, veggies and more - all sitting in your fridge waiting to be eaten. 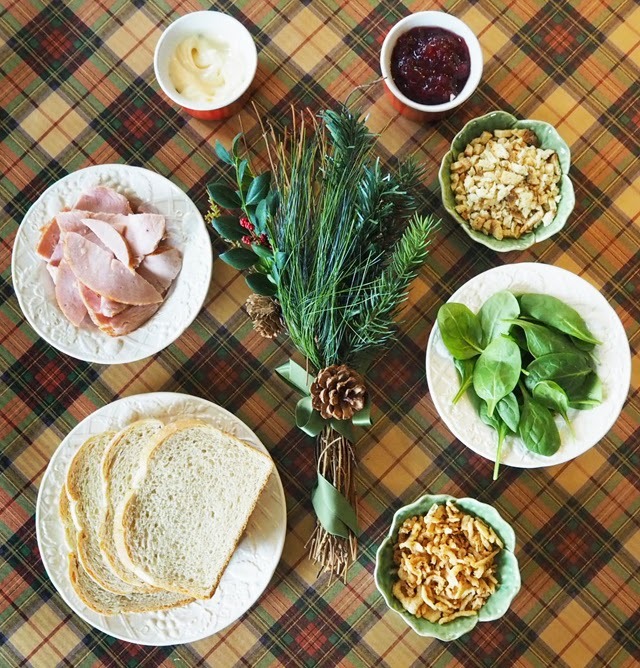 I suggest taking a note from all the big sandwich makers this Christmas and creating your own Christmas Leftovers Sandwich. 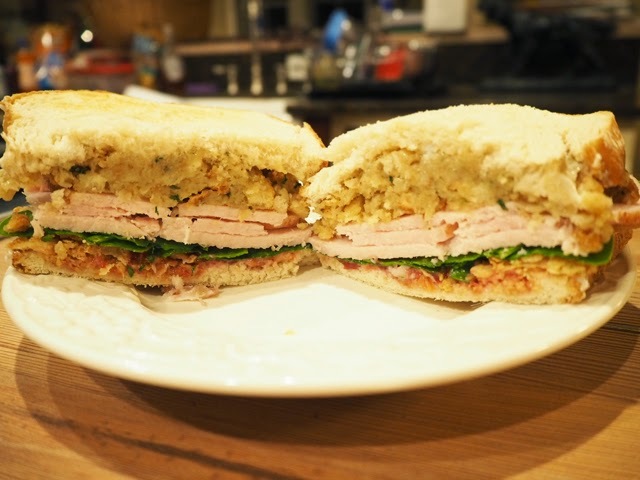 Sure, it's the equivalent in calories to a full Christmas dinner, but somehow it tastes all the better when stuffed between two slices of bread and made into a lunch to eat while cuddling up in front of some good holiday movies. You're on holiday. Live a little. Get 2 Slices of freshly baked bread - toast them! Spread mayonnaise on both slices of bread. Spread cranberry sauce on both slices of bread. Sprinkle fried onions on one side. These should stick to the cranberry and mayonnaise mixture. You want to keep these slippery little suckers in place. Top with a layer of fresh spinach leaves. Pile on the stuffing. 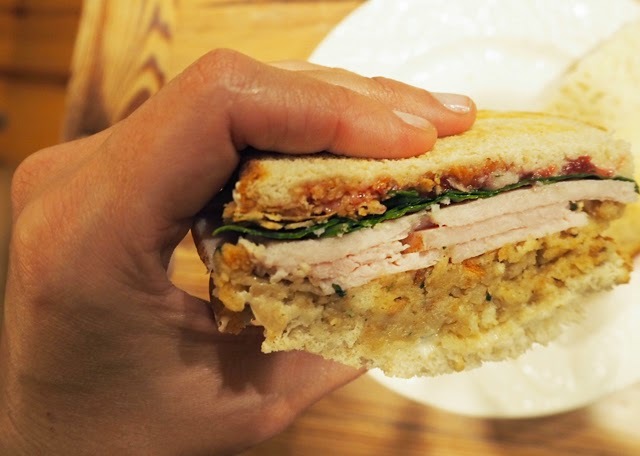 Depending on how high you want your sandwich to be or how flavorful, that's how much stuffing you should stack here. I've seen family members go high. Go high or go home, I say. Add your turkey. Again, if you want high, pile the extra turkey! And that's it folks. Just throw on a plate, grab a beer or a Coke and enjoy. I've yet to meet a sandwich lover that didn't fall head over heels for this leftover sandwich. It's pretty much heaven on a plate. You may want to organize a family run after eating.